Spring has officially sprung here at the fraudulent farmstead, even though the weathermen say we're going to have snow this weekend. I say they told us we were going to have blizzards that never happened on three separate occasions, so I'm choosing to believe they don't know what they're talking about. No doubt about it, spring is here. 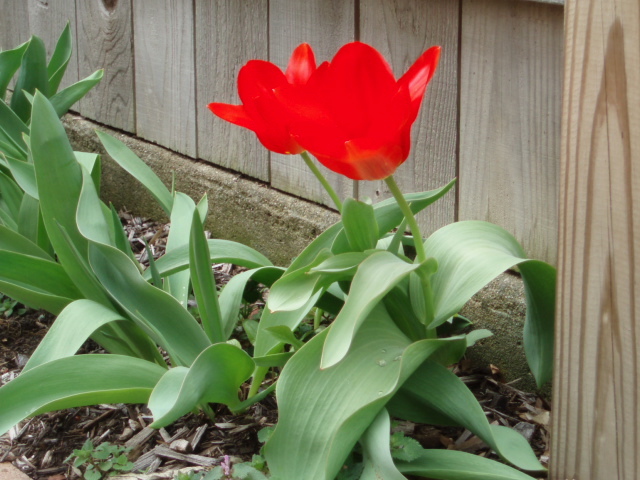 The grass is greeening up nicely, and the first tulip of the season has arrived. I planted loads of cheap bulbs from Lowes last year. Every fall I think I don't need to plant so many, but every spring I'm glad I did. Especially since the tulips peter out after a year or two. But not the daffodils! These clumps get larger every year. Plus, they're toxic, so the squirrels don't eat them. The squirrel mafia in my neighborhood love tulip and crocus bulbs almost as much as they love cat food. 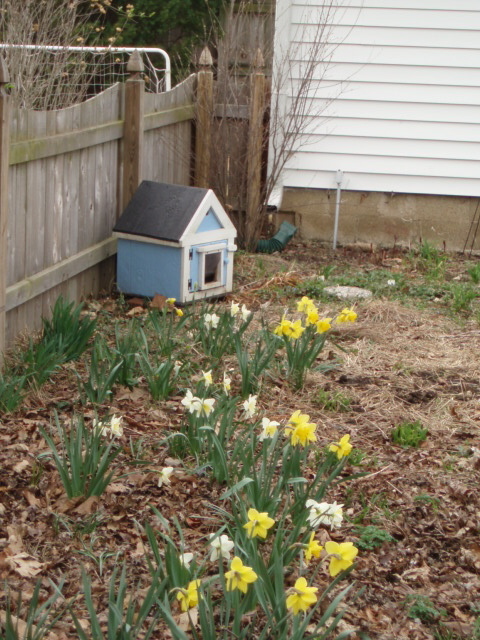 Another sign of spring: Lou's cat house has moved to the back garden. When the weather warms up, the cat house starts to smell, shall we say, a little ripe. Don't feel too bad for Lou, though. The BF helped me move all the outside furniture out of the garage, so Lou can now lounge on the cushioned wicker furniture on the front porch. Last Sunday was absolutely gorgeous. The BF and I worked for several hours. When he asked me where the grill was supposed to go, I said, " Well, it usually goes right where that composter is." In order to place the grill, we had to find a new home for the Biostack. We broke down my old heap, including the pallets, which are now in the garage waiting for inspiration to strike. The heap was half-full, which I was thrilled about. The BF figured I had more compost than I knew what to do with, which any gardener will tell you is impossible. We spread that compost all over the back garden beds, then raked the huge leaf mould pile out to cover the shade bed. And then we moved the Biostack to where the old heap had been, a task that involved loading the garden cart and two trash cans full of compost-in-progress, disassembling the bin, reassembling the bin in the new spot, and forking all the compost-in-progress back in. Then the BF did something brilliant with some old brick that ensured the grill did not sink directly into the soil when we moved it into its spot. We topped off the day with kebabs on the grill (the BF does a mean marinade) and dining amid the fruits (and flowers) of our labors. It was a damn near perfect day. 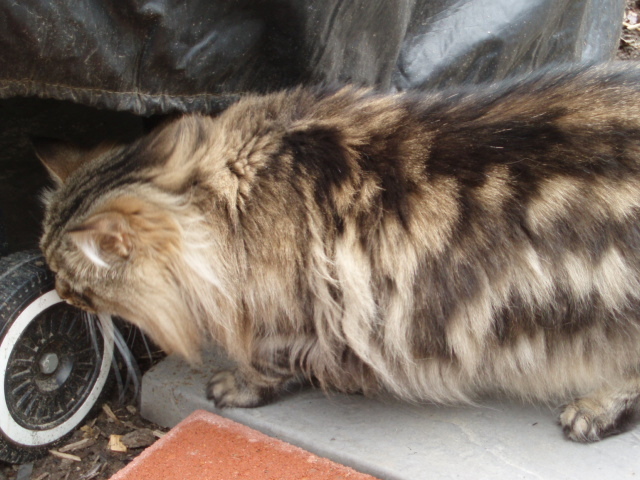 Above, Miss Kitty checks the placement of the grill. It was supposed to storm this afternoon, but instead we had a beautiful, breezy day with passing clouds. After a morning spent beating my income tax forms into submission, I rewarded myself with an hour in the garden. I saw the first bee of the season. 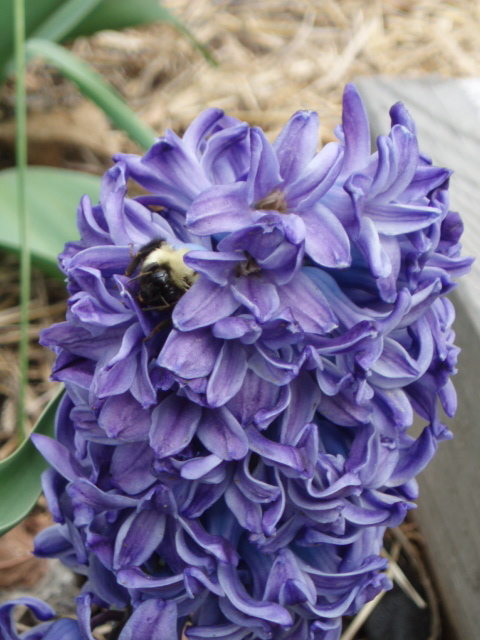 He was sleeping in the hyacinth at left. I transplanted the strawberry plants out of one of the raised beds into a border. I'm going to try my hand at some potatoes in that bed. I bought seed potatoes and onion sets at the Rural King in Monticello, which might just edge out Lowes as my new favorite store. I also got a fantastic pair of Carhartt overalls, which I love with an unreasoning passion. And yes, they are the boys' version. In other news from the potager, the tomato seedlings have their first set of leaves, although not their true leaves yet. The peppers and eggplant are slower to break through, but I'm checking every day. The hostas in hosta alley are just starting to crown. I'll be moving some of them to the shade border to make room for my enormous potting bench. 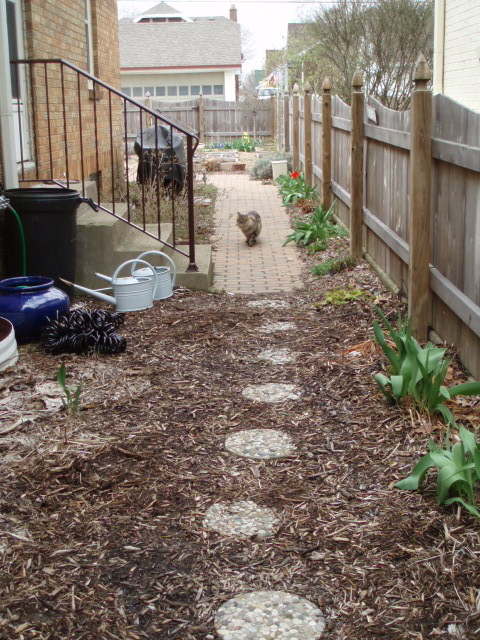 You can see at left the watering cans, trash cans, and hoses that already reside there, as well as Miss Kitty checking things out.